Map produced from the Ordnance Survey Get-a-map service, reproduced with kind permission of Ordnance Survey and Ordnance Survey of Northern Ireland. 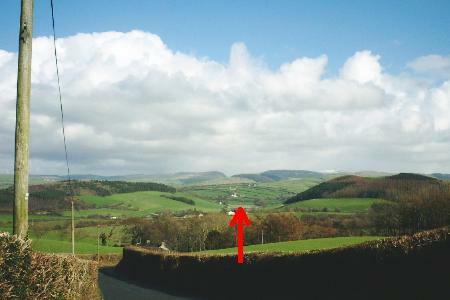 The red arrows on the map above and on the picture below indicate the location of the NERC MST Radar site (52.42°N, 4.01°W; British National Grid Reference SN 637 826). The radar site is 50 m above mean sea level (amsl). The picture was taken from approximately 80 m amsl and 2.5 km to the west of the radar site looking along the direction of the arrow on the map. The hills to the west of the radar site generally rise to no more than 150 m amsl. Note that the contours on the 1:250,000 scale map, shown above, represent altitude in feet rather than in metres; 1 foot is equivalent to 0.305 m. The terrain to the east of the radar site is much more dramatic owing to the Cambrian Mountains, which run approximately North-South through mid-Wales. The peaks of the hills seen in the picture immediately to the left (North) and right (South) of the radar site (which is 50 m amsl) rise to over 140 m amsl. The hills seen almost directly behind the radar site, at a distance of 8 km, rise to around 450 m amsl. The snow-capped peak, which is just visible to the right of the picture, is that of Plynlimon (Pumlumon Fawr in Welsh), which rises to 752 m amsl approximately 15 km from the radar site. 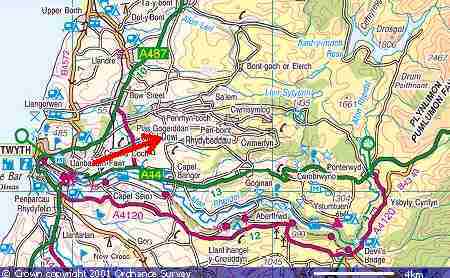 Owing to the fact that the radar is located within a valley, surface wind measurements are made from Frongoch, 3 km to the west of the site. The MST radar often detects vertical velocity fluctuations of the order of 1 m s-1, caused by mountain wave activity, when the low-level wind direction is from between the North and South through East, i.e. from over the mountains. Page maintained by David Hooper. 29th September 2004.